The 12th of (most) months for some reason just seems to hate me. The 12th of February is 2 days before Valentine’s Day, a day which symbolize love and was special for me and my ex and now is just a slap in the face because we’re no longer together so no longer celebrate that day. The 12th of March is one day before our anniversary. This coming year would have been 12 years together. He couldn’t even remember that when I asked him recently. He thought it would have only been 10 years. I was just…yeah…no words. Hurt is the best way to put it, I guess. More like broken, really. But this year on the 13th, I’ve been travelling to Seattle, to spend two weeks away from my hometown (and him) and hopefully seeing Jensen Ackles and the rest of the SPN cast and basking in SPN glory at SeaCon, and in the love of dear dear friends, at the very least, which is much needed. The 12th of June is 4 days before my father’s birthday and I have a VERY complicated relationship with my father, so that time of year, and especially right around his birthday, is always fraught with tension and stress and all sorts of complex feelings and emotions. Sigh. The 12th of July…4 days after the day we became engaged. 4 days after the anniversary of when my mother’s parents were married. Which is why it was so special that he proposed to me on that day. It was the same year my grandfather passed, so it was the first anniversary my grandparents were getting to spend together again, and he proposed to me on that day without even knowing, without MY even knowing. Now…it just breaks my heart. The 12th of October…Well, that’s this month and that’s the break-up anniversary. That should be enough said. The 12th of November is the day before the shared birthday of my mother and my ex. I hate not getting to spend his birthday’s with him or even see him on his birthday’s, because he’s always with his family, and “no one can know” that we’re still talking, much less “seeing” each other. Sigh. The 12th of December is 8 days before my parents’ anniversary, and God knows that brings up a TON of mixed emotions, because, I mean, if it wasn’t for that, I wouldn’t BE HERE, but then again, my mom would probably not be getting abused and be in the horrible horrible relationship she’s in if she was with someone else who actually gave a damn about her feelings instead of just his own. So to take my mind off of what October 12th “symbolizes”, I’ve decided to concentrate on the positive of what it “symbolizes”, in that it’s been one full month since I started this blog! To celebrate, I’ve decided to do something nice for you, my readers, and give away some stuff to help you commemorate your Halloween this year: scrapbooking supplies! 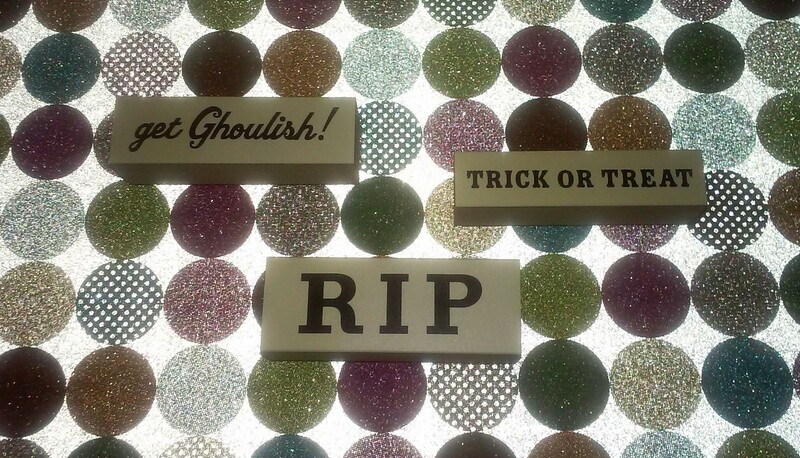 5 pages of thick orange card stock, 6 Happy Halloween/Trick or Treat! 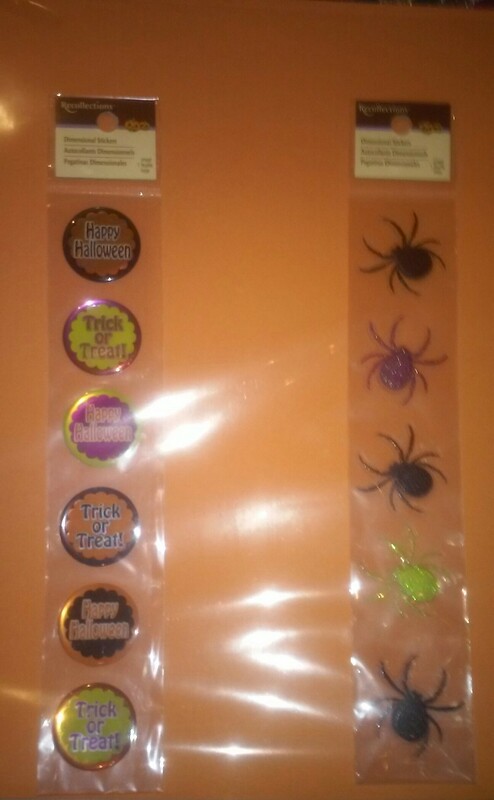 stickers, 5 3D glittery spider stickers, and 3 wooden Halloween related stamps (RIP, TRICK OR TREAT, get Ghoulish!)! You can enter below. I hope this works out the way it’s supposed to, being that this is my first giveaway and all, lol!